Dr. Anthony J. Arguengo III works with student Wesley Taylor. From the November 2015 Desktop News | Researchers in the Department of Chemistry, in collaboration with researchers in Germany, have developed a new way to use wood and other kinds of biomass to make chemical materials without relying on the usual non-renewable petrochemical starting materials. The idea, the researchers said, is to produce everyday products from renewable resources while remaining economically competitive and without harming the environment. Toward that end, researchers, including Dr. Anthony J. Arduengo III, the Saxon Professor of Chemistry at UA, show that traditional petroleum-based products can be synthesized in a way that recruits all the carbon atoms of a molecular skeleton exclusively from wood-based raw materials. Arduengo and his associates have collaborated with researchers at the Johannes Gutenberg University in Mainz, Germany. They have established an international collaborative research consortium StanCE, or Sustainable Technology for a new Chemical Economy, to develop and implement their innovations. Conventional petrochemistry provides a limited variety and shape of these building blocks, he said. Considerable energy and effort must be invested to re-shape the basic building blocks from petroleum into the various units needed to build more complicated objects. “Wood, a renewable resource that’s easily accessible, offers the opportunity to directly harvest a wide range of building blocks with diverse chemistries and structures that can then be used to build materials for the modern world,” he said. Arduengo sees the use of wood in the chemical industry as a game-changer. The UA team, led by Arduengo, focuses on fundamental chemical reactivity and structure at a molecular level and strives to make the most effective use of the inherent properties of wood ingredients for the new sustainable chemistry. 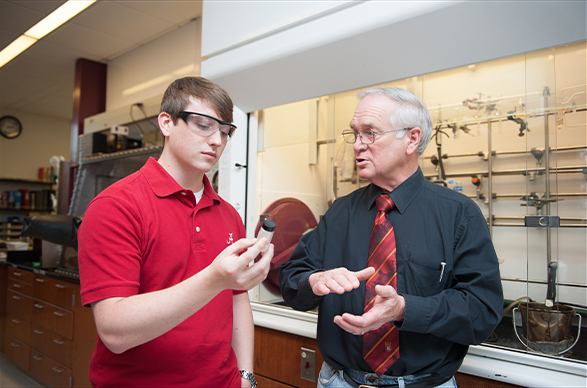 The group, which includes Dr. Jason Runyon, UA visiting scientist in chemistry, is supported by initial funding from a UA Research Grants Committee Award through the Office of the Vice President for Research and Economic Development, which helped establish the StanCE consortium. The collaboration with the German team, led by Dr. Till Opatz, began two years ago after discussions at a conference in Goslar, Germany, Arduengo said. The StanCE consortium brings together leading researchers from the United States, Germany, Japan and Canada to address industrial, technological and environmental issues facing this transition to a sustainable chemical infrastructure. The interaction between Johannes Gutenberg University and UA already has seen a number of successful transatlantic personnel exchanges, which serve to strengthen the technological underpinnings of the collaboration while providing participants with educational and cultural opportunities. In addition to the educational, technological and cultural benefits derived through the StanCE consortium, this developing technology offers a great potential economic benefit to the wood industry. The first results from StanCE collaborations on Xylochemistry were published on Friday, Oct. 16, by the Tuscaloosa and Mainz groups in the journal Angewandte Chemie, or Applied Chemistry (DOI: 10.1002/anie.201508500). This article reports the total synthesis of important pharmaceuticals and potential anticancer agents solely from wood-based starting materials.